Photo View Postcard. Multi. Cardstock. 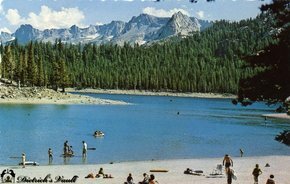 This glossy, full-color, scalloped edge card is titled, "Horseshoe Lake, Mammoth Lakes, California." Photography by Kelsey. High Country Cards, Bishop, California. Henry McGrew Printing, Inc. Kansas City, Mo. With Logo. Unused.